If you and your loved one are looking for a soothing Athens evening and way to spice up the relationship, consider our this couple’s massage? You can enjoy each other’s presence in a private setting while experiencing a rejuvenating rest and repair treatment. All spa packages include hot towel, aromatherapy, salt scrub and hot stone treatment. Together, you can sit back, relax, and put your feet in our hands to soothe your soles. You start with a hot-water mineral foot soak, while simultaneously receiving reflexology and massage of the face, head, neck and shoulders. Then, acupressure on your feet and lower legs that stimulates reflexive points that promote inner organ functions and improved well-being. In today’s busy world there is seemingly less time to relax with your loved one. As a couple, take the stress and aches of your day away with this blissful rejuvenation treatment. A relaxing stress reliever that loosens stiff muscles and improves circulation in your hands. This massage finishes with a hot-water mineral foot soak, and stimulating acupressure on your feet and lower legs. Rejuvenate in a complete state of tranquility while being pampered like royalty. This full-body complete couples package provides the best pampering and reflexology massage to every part of your body. This package includes all of our massage services plus our our hand and foot hydration treatment. This is a full 90 minutes of complete relation and rejuvenation to experience together. 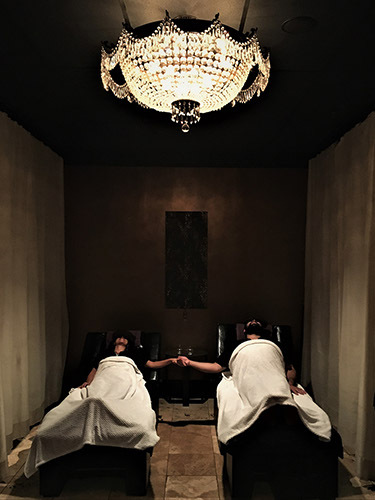 Whether you’re looking to escape the stresses of everyday life, or spend one-on-one time together, a couples massage is always a great option that you won’t regret! Visit www.yourfootpalace.com or call our Athens Spa 706-521-5290 to make your couples massage reservation.